In today’s fashion era, top sports brands have started to branch out from their traditional setting. Rather than simply creating a shoe best tailored to athletic performance, they are shifting gears to a more stylish and marketable approach. For brands such as Nike, PUMA and Adidas to accomplish this, they have turned to some of the most notable icons in pop culture: music artists. Rappers and pop singers alike have a foothold in the “kicks” culture, and this is a two-way street. If you have listened to any hip-hop at all this year, it’s hard to find a song where the artist doesn’t reference fashion. When an artist has a shoe deal, their audience can have a direct look at the artist’s personal aesthetic and style. The sneaker embodies the artist’s creativity, and their music lets the would know how important their wardrobe is to them. There is no better way to start a conversation about artists in the sneaker game than with Kanye West. His Yeezy line with Adidas has showcased many different renditions. Even before his traditional fashion line hit Fashion Week, he released the Yeezy Boost 750 and 350, which sold out almost instantly and has not slowed down since. 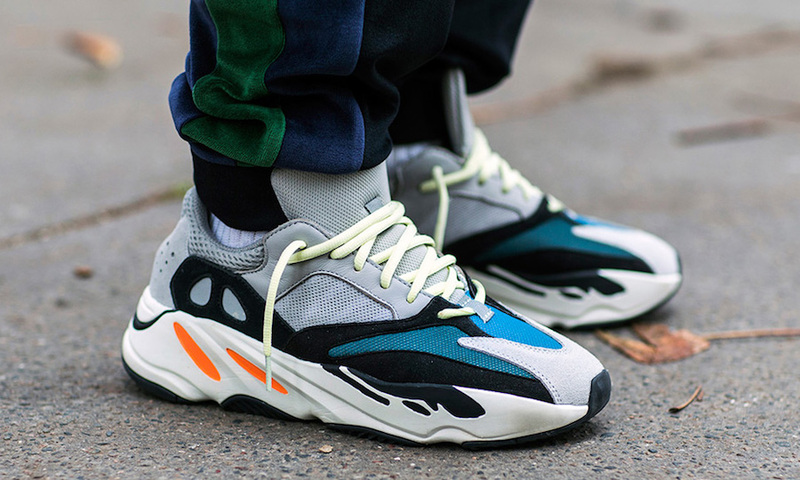 The Yeezy Wave Runner 700 debuted in the Yeezy Season 5 collection in August 2017 for 300 dollars. Even after quickly selling out, a restock was not released until September 2018. Per usual for Yeezys, if customers miss a release, they are vulnerable to the inflated resale prices of online sneakerheads. Along with the release of Kendrick Lamar’s 2017 album “DAMN.” came a sneaker collaboration. In August 2017, it was revealed that Kendrick Lamar had signed a Nike deal, and it didn’t take long for them to bless us with a Kung Fu Kenny inspired sneaker. In January 2018, Kendrick introduced the shoes on Instagram and Nike dropped the ‘Cortez Kenny 1’ three weeks later. DAMN, indeed. PUMA has certainly made a point to achieve retail success by appealing to a pop culture crowd. In 2014, the line offered Rihanna the position of creative director. From then on, Fenty PUMA by Rihanna has been a source for both stylish and athletic apparel and accessories. Her first sneaker release in 2015 introduced the still-popular Fenty PUMA Creeper, which would go on to win Footwear News’ “Shoe of the Year” in 2016. PUMA also released the Fenty Avid in March 2018, which showcased creativity with a sporty twist. In its first year, PUMA brought on Jay-Z as creative director for their all-new basketball line.. Jay-Z had a huge influence on young NBA athletes like DeMarcus Cousins, Terry Rozier, Deandre Ayton and Marvin Bagley rocking the shoes on the court. 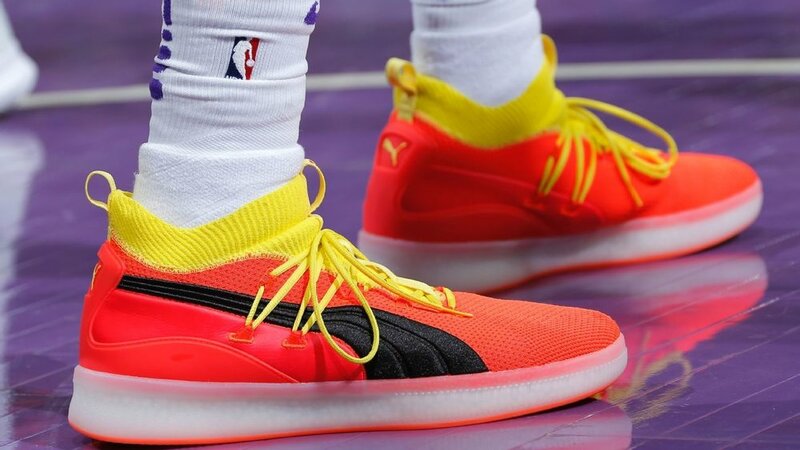 The first ‘Red Blast’ colorway of the PUMA Clyde Court really caught the eye of basketball sneakerheads, and was proof of Jay-Z’s ability as a new addition to the company. Arguably the most extravagant and style-oriented rapper made sure to get his own influence on this sneaker trend. In October 2017, Travis Scott took to Instagram to confirm that he was #teamnike and had some collaborative work-in-progress. Before then, he had released his first sneaker with Jordan, a partner of Nike, called the Jordan Trunner LX Cactus Jack. Since then, he has released the Air Force 1 Low ‘Sail’ and the Jordan 4 Retro Cactus Jack, which are pictured here being worn by Houston Rockets basketball player PJ Tucker. Released in early June, they retailed for 225 dollars. Last year, Ariana Grande announced a partnership with Reebok and alluded to the company’s goals as a reason for her association with them. After a busy year of music releases, she was featured as the face of the Reebok Rapide sneaker (above) reboot, which originally debuted in the 1990s. The new Rapides retail for 80 dollars. Ariana joins Gigi Hadid and recently signed Cardi B as an ambassador for the brand. Artists and sneaker brands are simply a marketing match made in heaven. Fans can directly show support for their favorite artists by wearing merch, and a stylish shoe with their idol’s signature is a perfect way to display that fandom. The bigger the artist, the more notable the shoe will be, which is what entices these brands to join in on the trend. As rappers compete lyrically with each other in song, you can find them referencing the popularity of their shoes as another form of competition. For instance, in Kanye West’s track titled “FACTS”, he demonstrated the competition between Nike and Adidas by saying, “Nike, Nike treat employees just like slaves, Gave Lebron a billi’ not to run away.” In rap hit, SICKO MODE by Travis Scott, featured artist Drake proclaimed “checks (Nike) over stripes (Adidas).” It’s evident that sneakers mean a lot to music artists, and promoting them in their songs is the best way to influence sneakerheads to participate in the trend.